Your conservatory is an important part of your home and often a well used room that you like to keep clean. Our reach and wash pole system enables us to clean all areas with ease. 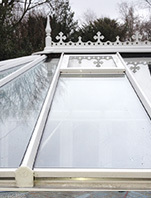 Conservatory roofs are washed free of all dirt and grime as well as making its plastic edging shine like new again. We are Fully equipped to deal with all types of conservatory cleaning. From polycarbonate roofing to full glass roofing. From steep pitched awkward roofs to flat roofs. We use our pure water system and an anti fungicidal wash to clean your conservatory, keeping it looking fresher for longer. Whether its just the roof or a full valet you need, we can meet your requirements. Call us today on 07831 115476 to arrange your one-off or regular clean.